My friends Kelly and Beth High's kids posed for this winter painting with the line "Over the river and Through the Woods" as a part of the title. I plan to do Over the River one day. It was 95 degrees when we took the photos. The kids weren't thrilled! 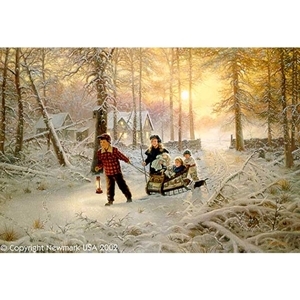 Listen to the crunch of the snow and the sound of happy voices as children are headed to visit Grandma's house. Over the river and " Through The Woods ", a chilly trip on the fresh snow is an adventure to enjoy, but it will pale in comparison to the warmth of love and the taste of treats what await them at the end of the wooded lane.